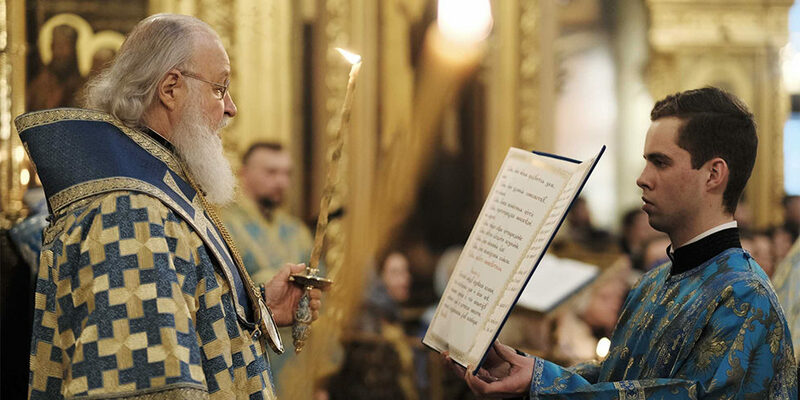 On this day, the eve of Saturday of the fifth week of Great Lent (or the Saturday of the Akathist), His Holiness Patriarch Kirill of Moscow and All Russia served Matins service with the reading of the Akathist to the Most Holy Mother of God before the miracle-working icon “Tenderness” at the Moscow Theophany Cathedral in Elokhovo. 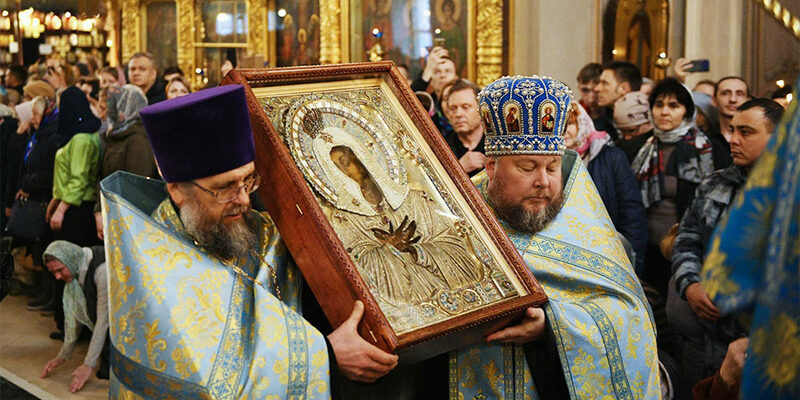 The Seraphim-Diveyevo icon of the Mother of God “Tenderness,” Venerable Seraphim of Sarov’s cell icon, stays at the Patriarchal Residence’s Vladimirskaya Church at Chisty Lane, Moscow. 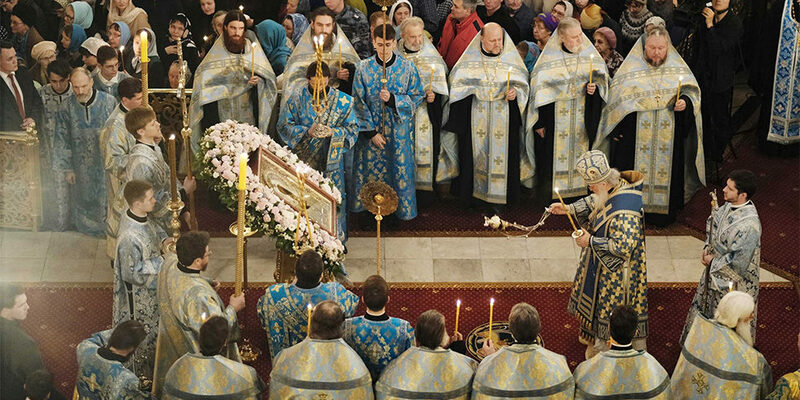 According to tradition, on the eve of the Saturday of the Akathist, the Primate of the Russian Orthodox Church brings forth the icon to the Theophany Cathedral. After an icon was greeted ceremoniously, it was installed inside the cathedral for prayerful veneration. His Holiness concelebrated with Metropolitan Arseniy of Istra, Patriarchal Vicar for Moscow; Archbishop Matthew of Yegoryevsk, Northeast Moscow Vicariate Director; Bishop Dionysius of Voskresensk, first deputy Chancellor of the Moscow Patriarchate; Bishop Thomas of Bronnitsy, Abbot of Donskoy Stavropegial Monastery; Protopresbyter Alexander (Ageikin), rector of Theophany Cathedral; Prot. Valentin (Asmus), Professor of St. Tikhon’s Orthodox University and rector of Protection Cover of the Mother of God Church in Krasnoye Selo, Moscow; Prot. Sergiy (Tochyonny), rector of St. James the Apostle’s Church in Kazyonnaya Sloboda and the Renewal of the Jerusalem’s Resurrection Church in Barashy; and capital city’s clergy. The liturgical chanting was performed by the Theophany Cathedral’s two choirs (Choir Directors A.K. Mayorov and E. Yu. Loginova). “Soyuz” TV Channel broadcasted live from the Patriarchal service. 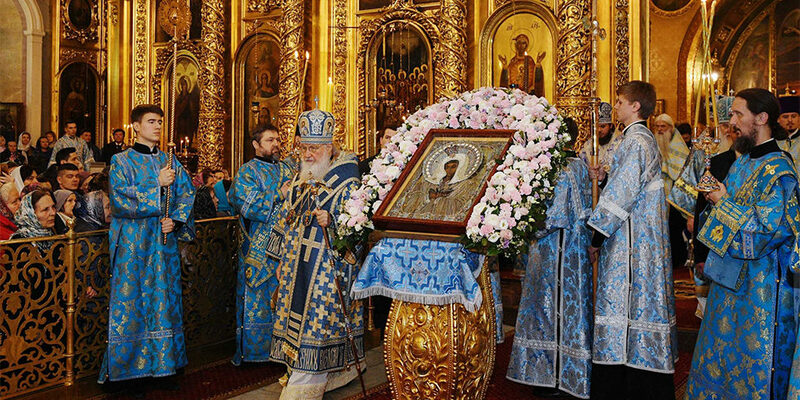 Upon the completion of Matins service, the clergy and numerous faithful venerated the revered Seraphim-Diveyevo icon of the Mother of God.